Anne with an E on Netflix: Cancelled or Renewed for Season Three? How long will we tarry with our kindred spirit? Has the Anne with an E TV show been cancelled or renewed for a third season on Netflix? The television vulture is watching all the latest TV cancellation and renewal news, so this page is the place to track the status of Anne with an E, season three. Bookmark it, or subscribe for the latest updates. Remember, the television vulture is watching your shows. Are you? 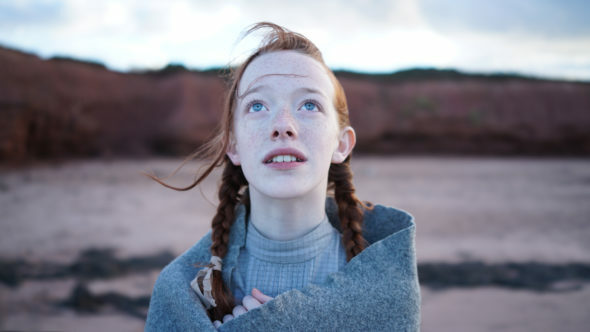 A CBC and Netflix period drama, inspired by Lucy Maud Montgomery’s Anne of Green Gables book series, Anne with an E stars Amybeth McNulty, Geraldine James, R.H. Thomson, Corrine Koslo, Dalila Bela, Aymeric Jett Montaz, Lucas Zumann, and Kyla Matthews. The story follows Anne Shirley (McNulty), an intelligent and fanciful Canadian orphan, who is fostered on Prince Edward Island, by siblings Marilla (James) and Matthew (Thomson) Cuthbert. The second season introduces new characters, Dalmar Abuzeid (Sebastian Lacroix) and Cory Grüter-Andrew (Cole MacKenzie), created for the coming-of-age series. Anne with an E has been renewed for a third season which will debut TBD. Stay tuned for further updates. Unless they decide to publicize viewership, it is difficult to predict whether Netflix will cancel or renew Anne with an E for season three. To some extent, the show’s fate depends on its reception in Canada, where it airs on CBC. Since season two doesn’t premiere there until September 23, 2018, the global audience may have a bit of a wait for a cancellation or renewal decision. For now, I’ll keep an eye on the trades and press releases and update this page with breaking developments. Subscribe for free Anne with an E cancellation or renewal alerts. 8/15/18 update: Netflix and CBC have renewed Anne with an E for a third season. Details here. Review ratings for network TV shows. Find more Anne with an E TV series news or other Netflix TV show news. Explore other TV show status pages. What do you think? Are you glad that the Anne with an E TV show was renewed for season three? How would you feel if Netflix and CBC had cancelled this TV series, instead? More about: Anne with an E, Anne with an E: canceled or renewed?, Anne with an E: ratings, CBC TV shows: canceled or renewed?, Netflix TV shows: canceled or renewed? Easy: Is the Netflix TV Series Cancelled or Renewed for Season Three? Marvel’s The Defenders: Cancelled or Renewed for Season Two on Netflix? All About the Washingtons on Netflix: Cancelled or Renewed for Season Two? Glitch: Is the Netflix TV Show Cancelled or Renewed for Season Three? Insatiable: Cancelled or Renewed for Season Two on Netflix? The End of the F***ing World: Cancelled or Renewed for Season Two on Netflix? Anne with an E: Cancelled or Renewed for Season Two on Netflix? 13 Reasons Why: Cancelled or Renewed for Season Three on Netflix? Narcos: Cancelled or Renewed for Season Four on Netflix? Love it. Happy it is being continued. Great acting and story, but a little smaltzy.